Heath Fair Weekend - August 21, 22, and 23rd! 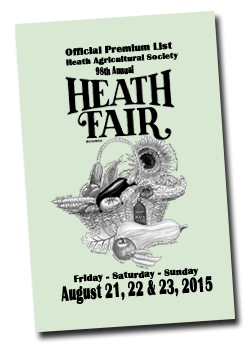 The Heath Fair begins Friday at 5 p.m. at the fairgrounds off Colrain Stage Road in Heath. Saturday and Sunday have the animals: shepherd dog demonstrations at 10 a.m. and 2 p.m. and a horse draw at 11 a.m. Saturday, with an ox draw Sunday at 9 a.m. and a Poultry Know-How Swap or "agri-conversation" at noon. Saturday the fair runs 8 a.m. to 10 p.m., Sunday 8 to 5. There will be food and music throughout. Parking is $1 close up, free in the lower lots. General admission is $8, $6 for seniors, free for children 9 and under, and leave the pets at home. Check out the Heath Fair website for more information!